Dr. Mun Y. Choi, who is the first Asian American to become president of the University of Missouri System in 177 years of its history, is awarded an honorary doctorate at POSTECH. 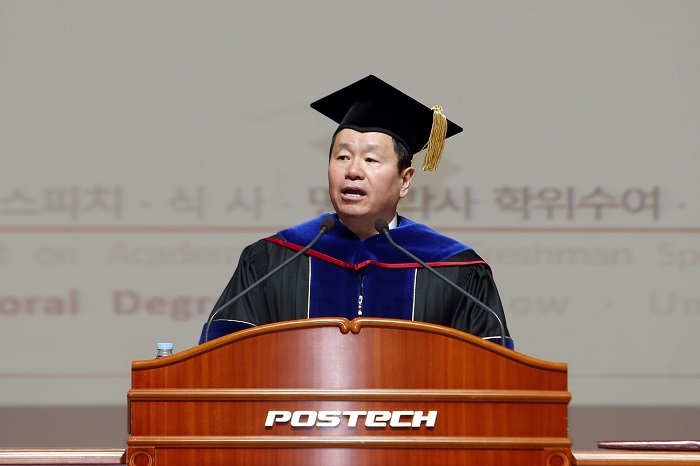 POSTECH decided to award an honorary doctorate of mechanical engineering to President Mun Y. Choi and, the degree was awarded to him at the 2019 POSTECH Matriculation Ceremony held in the auditorium of the university on February 15. President Choi, the world’s renowned scholar in thermal engineer-ing, immigrated to Ohio, U.S.A with his family at the age of nine and, he received his master’s and doctorate degrees in mechanical and aerospace engineering from Princeton University. After serving as a faculty at University of Illinois at Chicago and Drexel University, he was appointed as a dean of engineering at the University of Connecticut (UConn) in 2008. In 2012, he took on a role as a provost and executive vice president of the university. During his term in the office, he led development of research capa-bilities and increased industrial partnerships, making the UConn a top 25 national university. Acknowledging his leadership, the University of Missouri System with its 177 years of history appointed him as the first Asian Ameri-can president to oversee its four campuses and 77,000 faculty and staff in March 2017. With reference to honorary doctorate, POSTECH has been awarded honorary doctorates to distinguished people in the nation and around the globe, who remarkably attributed to development of aca-demia, the nation, and humanity. After Dr. Roderick MacKinnon of Rockefeller University, who won the Nobel Prize in Chemistry, first received the degree in 2006, it was awarded to six more individuals including Dr. Jeong-Hoon Kim, former president of Bell Labs in 2010, Dr. Peter S. Kim, former president of Merck Research La-boratories in 2011, Seok-hyun Hong, chairmain of JoongAng Hold-ings in 2016, Ryoji Noyori, Nobel laureate and endowed chair fac-ulty of Nagoya University and Jin-kyu Huh, chairman of Iljin Group in 2018.